I have always believed from the bottom of my heart that Christmas holidays are the ideal time to get together and rejoice in the beautiful weather as well as the age-old traditions and customs that come along with it. 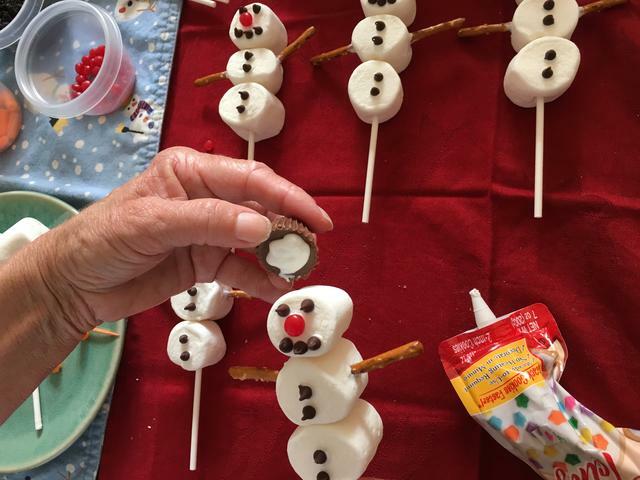 The lights, the gifts, the snow, oh-so-delicious snacks are worth the year-long wait. 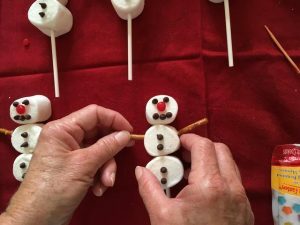 So last year, I decided to make the most of the short holiday and came up with an activity that every member of the family could bond over and happily engage them in- making marshmallow snowmen- and what a huge hit it was! 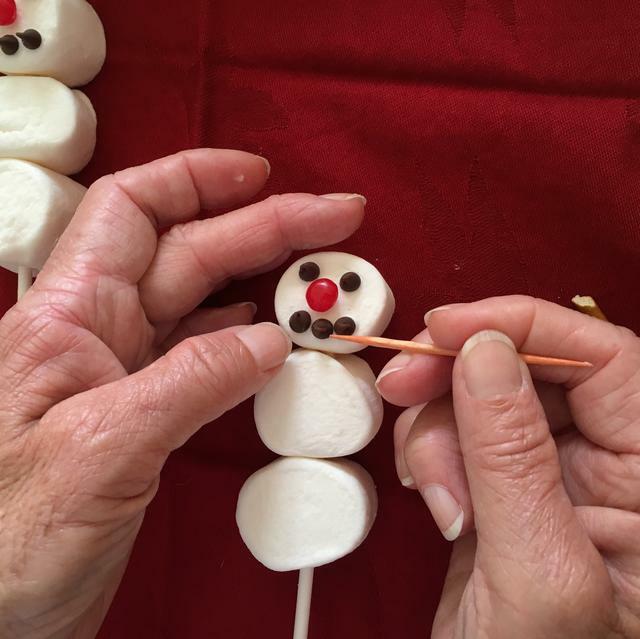 Secure the stack of marshmallows in place one by one on toothpicks, skewers or straws. For a simple marshmallow snowman, attach 2-3 marshmallows into a stack using plain white icing. For the eyes, apply a blob of icing at the flat base of the chocolate chips and stick them on the head or first tier of the snowman. 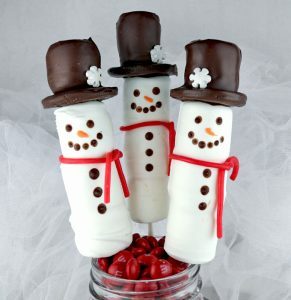 You can also use a dollop of black colored icing from a tube instead to make its eyes. Repeat this step to make the nose. You can also use a red drop of icing or a dried cranberry to serve as the nose of the snowman. After the nose, give it a beautiful broad smile in a similar way. 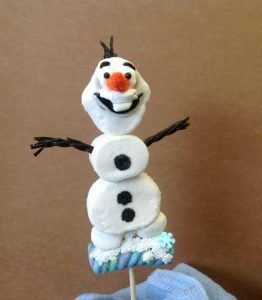 Take a long pretzel stick and split into two Grab two pieces of 3-4 cm long pretzel sticks and insert it onto the sides of the second marshmallow to make the arms. 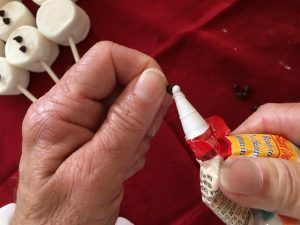 Alternatively, secure two smaller marshmallow cubes on two toothpicks and add them on either side of the second layer for arms. Although optional, you can take a licorice lace and wrap it around its neck to make a cute scarf. 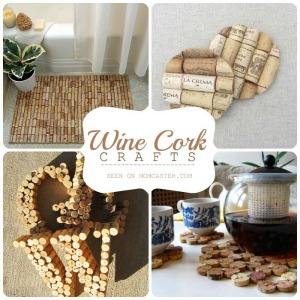 You may also dip it in white chocolate and roll it in sugar for a different texture. 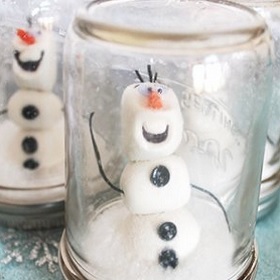 “Do you wanna build a snowman?”! 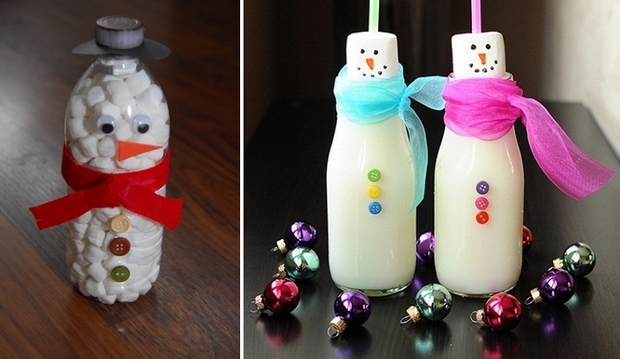 If yes, why not make it like Frozen’s Olaf, the talking snowman? Make a pointy orange nose, draw a big smile with big white buck teeth, use black licorice sticks for the arms and hair, and there you have your Disney themed snowman. 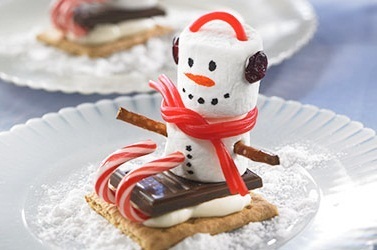 Try making a delicious holiday snack such as smores by taking a marshmallow snowman, and fixing it with icing on a graham cracker or any crisp biscuit along with a piece of chocolate. 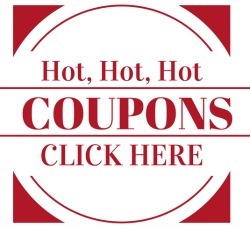 You can even melt it in the oven and slather it onto cookies for a sumptuous topping. Marshmallow snowmen are the most elegant embellishments you could think of for your cupcakes. 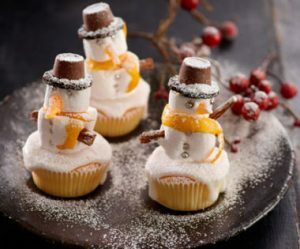 Use some buttercream, melted marshmallow or icing to secure the snowman on your cupcake. Shower it with a bit of powdered sugar for a snowy look. Another fabulous dessert decoration idea would be to adorn your snowman with a funky Oreo hat and season it further with molten chocolate. For a lip-smacking ornament, put your marshmallow snowmen along with gingerbread men in a jar or bottle, close the lid, tie a ribbon around the neck of your jar and hang it from your Christmas tree. 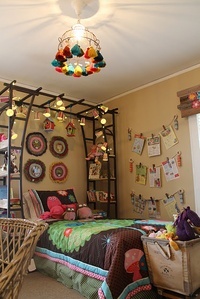 You can also sprinkle your lollies with edible glitter, place them all in a small plastic tub with a handle and hang it. 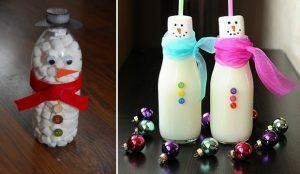 While sending out these snowmen as Christmas gifts, put them in a mason jar inserted upside down to give it a globe-like appearance. 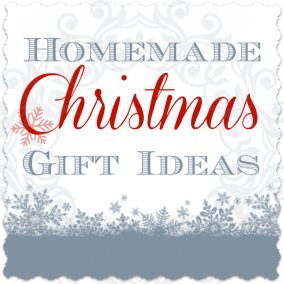 You could even pack them in a small cellophane bag with a showy ribbon tied around. 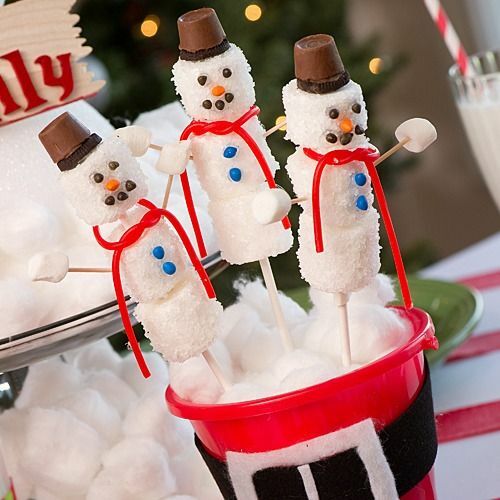 For an ‘authentic’ Christmas look, put your snowman shaped marshmallows on a sled made of candy cane and sprinkle some icing sugar on top of it all. 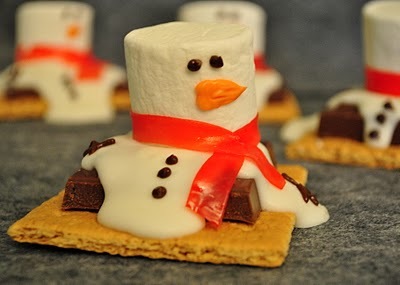 This holiday, I insist all of you gather your entire family- elders, kids et al., and have a go at this ludicrously simple and quick holiday snack made with marshmallows or ‘snowman poop.’ I assure you, it will become your kids’ favorite treats to munch on- with or without the holiday season!